Even if you ignite a client’s interest, there’s a potential hurdle to overcome in convincing them to commission your agency: two thirds of clients believe that agency case studies lack business context*. Are you missing a trick? You may be delivering great creative, but if you’re not backing this up with evidence that your design work has commercial clout, then you could be failing to maximise your opportunities to differentiate in a competitive and crowded market. Entering the DBA Design Effectiveness Awards provides the perfect motivation to develop case studies steeped in business context and to prove the value of your work. A DBA Design Effectiveness Award win is not only a great PR story and morale booster. 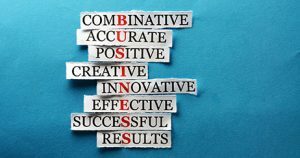 It also provides independent acknowledgement that your agency can deliver an excellent return on investment – highly persuasive in the argument as to why a client should choose you. And if you are a client or design manager responsible for commissioning and managing effective design, there is no better way to independently prove the commercial success of your work than entering the awards. A win will help you champion the need for design within your business and provide a solid case for protecting and increasing your budget. *From the What Clients Think 2016 Report by Up to the Light in association with the DBA. A report based on 435 client interviews conducted on behalf of agencies. View the report in full. With limited budgets, Challs International’s main marketing investment is in design. Its ongoing design investment and long-term collaboration with agency Elmwood has elevated its Buster brand from obscurity to a serious category contender in the last decade, and Challs are convinced on the value design brings to their business. “When you don’t have huge above the line budgets, you need to invest wisely. The focus of our investment for 12 years has been using the power of design to cut through at the point of sale, and that has been pivotal in making Buster the No.1 brand”, says Challs International’s MD, Graham Burchell. Buster emerged from obscurity on to the supermarket shelves following a brand overhaul by Elmwood in 2004. Since then the company has continued to invest in design. A brand evolution in 2009 helped elevate the brand to No.2 in the sector, but by 2013 the continuing global recession and competition from well-financed mega brands in the UK plughole category, meant the market wasn’t exactly free flowing. With specific objectives to create a platform for sustained growth, to expand internationally and ultimately to claim the top slot in the UK market, Challs chose to invest in design once more, and Buster has made it to the top of the market with packaging that cuts through at the point of purchase. 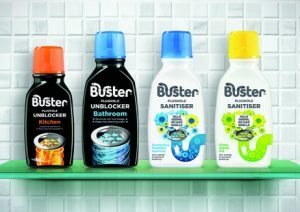 In a sector where consumers are normally faced with a wall of power graphics, Buster challenged category norms and contrasted with simple, calm design and a change of tone, becoming the No.1 plughole brand in the UK market months ahead of target in May 2014, and reducing its heavy reliance on sales of one of its products. Buster is well and truly on track to achieve its 5 year plan of doubling value sales way ahead of schedule. Elmwood and Challs International’s GOLD winning DBA Design Effectiveness Awards submission can be viewed in full here.